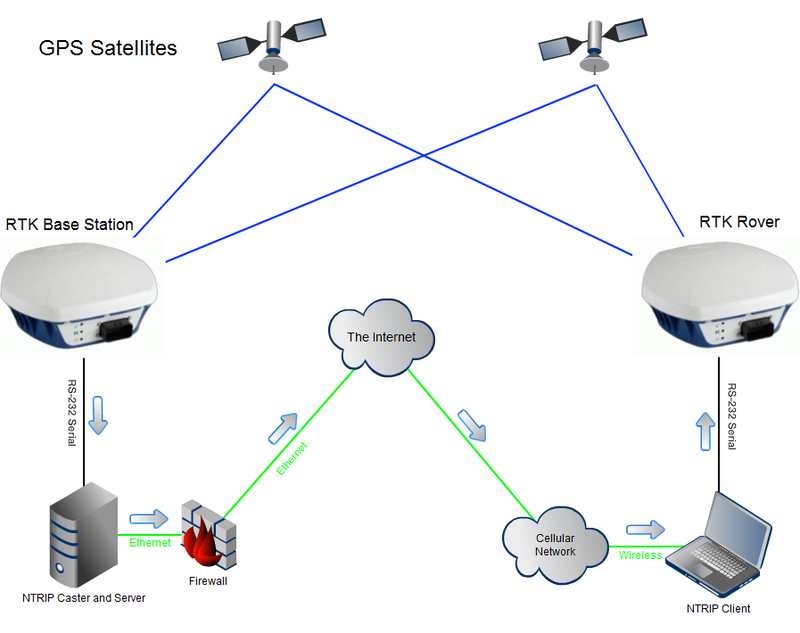 Network Transport of RTCM data over IP (NTRIP) is a protocol used to transport RTK correction data over the Internet. The correction data is moved in a way similar to that of streaming audio. Essentially a client connects to some device serving the stream and requests a copy of that data. Transporting RTK correction data over the Internet is an alternative to using radios to transport the data. The GNSS receivers don't know or care how the correction data gets to them, so we can transport it in any way as long as the bytes are in the same order when they get to the rover. The NTRIP software components were named poorly, causing confusion about which pieces wait for connections, and which ones initiate requests. - NTRIP Client (functions as a TCP/IP client) - This is on the rover side. It initiates a connection to the Caster, asking for data on a certain stream. - NTRIP Server (functions as a TCP/IP client) - This is on the base station side. It initiates a connection to the Caster, asking to upload data for a certain stream. - NTRIP Caster (functions as a TCP/IP server) - This is device listens for connections, and will forward data from one NTRIP Server to many NTRIP Clients. This the traditional scenario where you have a single caster that hosts numerous streams. Each base station connects to the caster to upload the data stream. Clients then connect to the caster to download their desired stream. In this scenario, the Caster will commonly live in a data center since it just moves data. 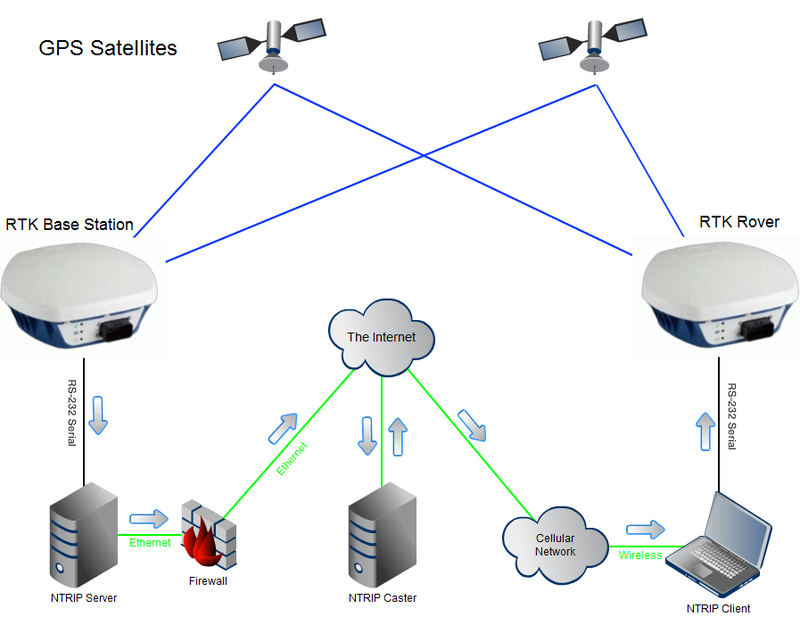 Each base station is has a serial connection to a NTRIP Server, which encapsulates the data into TCP/IP packets and sends them to the caster. If you manage a NTRIP Caster, you will need to ensure that your firewall allows TCP packets in to the caster software on whatever port number it is listening on. Both the NTRIP Server(s) and NTRIP Client(s) will connect to your Caster on its public IP at that port number. If you manage a NTRIP Server, you do not need to do anything special on your firewall. A NTRIP Server functions as a TCP/IP client, meaning that it initiates the connection to the Caster. You will need to know the IP address and port number of the Caster, and also the mount point (stream) and password to send data in to that mount point. This will likely be the ideal solution for scenarios where you will only have one data stream and a small number of clients. The Lefebure NTRIP Caster software includes the ability to connect to one serial port and make that data available via on the NTRIP caster. In this scenario, the Caster will commonly live in an office or home, physically close the the base station. There has to be a serial connection between the RTK Base Station and the computer, which means you are limited to the maximum distance your cables can carry the serial data. - A reliable computer with at least one serial port. - A reliable Internet connection. - A static IP address from your Internet provider (so the public IP address doesn't change). - Configure your firewall to allow TCP port forwarding to the internal IP address of the computer running the Caster software. - The Caster should also have a manually assigned IP address on the internal network so that the firewall is always forwarding the incoming data to the correct device.